First thing first - allow me to say that it takes one special human journey to earn the right to start an article with words like that. Trippy, that is the word that comes to mind when I look back at my human journey. One challenge after another: from being vaccinated a few times more than other kids of my time to breaking a spine at 14, and growing in an abusive disturbing environment, from being diagnosed with one dis-ease after another through out entire life (no wonder - after that vaccine cocktail!) to not being able to talk properly until later on in life (very embarrassing it was, but not to worry - I made up for it since I tuned into my True Self), from living in this super sensitive body that acts like some alien radar from the future (plant based, high vibe, honest and fresh food only or no food at all) to having this loud open Heart that feels everything and cares so much about everything. Oh well, anyway, enough about me. I feel you got the picture, at least a little glance. It was a long journey to get where I am today - Happy Healthy.. and utterly Grateful to be alive and here among you, beautiful people. How do we start Healing? Where do we even begin? I had an honor to be a part of many healing processes. Not all of them ended with what we call a success, but they all showed me the same formula, the same recipe, and I wish to share it with you. Remember this - "Nothing ever is, but is always becoming." Plato said that, and he was right. Nothing is fixed or solid, and neither is whatever that thing that we might be diagnosed with. You can stop the process, and even reverse it. You can do it! And what is interesting here - only You hold the power to do that. No doctor with no degree, and no amount of money can create that effect. It is You. You plus courage and determination. So, Healing INGREDIENT #1 is COURAGE. Be brave not to follow the rules. Let no one plant fear into you and convince you that their way is the only way. Years ago I was told that I would end up in a wheelchair by 40 if i refused to take pharmaceuticals. "Gotta be a better way," That is what I said. Did I know the way at that time? Nope. Did I believe that I would find it? Kinda. I was not sure what I was doing really. I just knew what felt wrong. And getting on pharmaceuticals that have a list of side effects more scary than the symptoms of the auto-immune disorder that everyone thought I had...did not feel right. No thank you. After the vaccines, I have enough chemicals in my blood stream for the next ten lives. Guess what? I am coming to my 50 this year. On my-my.. I did not think I would make it this far, so GRATEFUL. I walk around in awe of having a life, and that is a totally another dimension of human existence. Back to the formula. Tune into your inner GPS. Research until you feel that something resonates with your unique journey. We all know how much information is out there these days, It is confusing to say the least. I feel compassion for those who are disconnected, not sensitive, not aligned with their higher senses, it is so easy to drawn in this ocean of information when we are not in tune with our cosmic GPS. Stay tuned into your inner higher sense, think with your belly brain, follow your intuition. So, INGREDIENT #2 is your Cosmic GPS. What is better? Trusting your own flying or flying of someone else, who is very often does not have your best interest at heart. I am referring to Big pHarma here, as you probably figured. It is a risk taking anyway, so I d rather take my own and hold my Self responsible. - invite as much support as you possibly can - CBD, Ozone, intravenous vit C, healing herbs, energy work, hanging out with high vibe medicine people, etc. Anything that activates our own inner self-healing mechanism is good for us at this point. - get out of EMF, not a healing zone. - remain open and recipient! Nothing ever is, remember. So, healing INGREDIENT #3 is your connection to the Source. Many of us get unwell because this connection is broken. I know this is easier said then done. I have been there and I know that HEALING process is not much fun, it is rocky and volatile, it is up and down... but with full honesty, it is easier with faith, then without. Surround yourself with what and who empowers your FAITH and activates your miracle gene. Know - You are an important element of something bigger than You. Know - this is not for nothing! Whatever it is that you came here to HEAL, is a big cosmic deal. Your journey has a deeper meaning, even if it does not feel like that at this point. Healing is a powerful energy. It transcends earthy into universal, it makes human divine, it turns pain and chaos into peace and harmony. It is profound! You are a part of something profoundly important. You-niverse believes in You. You are special like that. You can do this as many of us could... we are shining the light to your human journey, so one day You shine to others too. 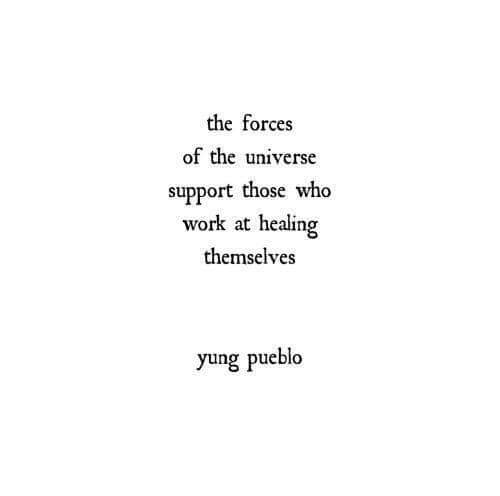 with love and respect to all those who are here to HEAL this realm. Newer PostFasting as a Healing Tool. How to Start. Beginners Guide. Older PostYoga is ... a date with your Self!